As the virtual inventors of the magnetic knife rack there is no one better to help you find the perfect knife storage solution for your home or professional kitchen. Whether you are looking for a classic or contemporary designed rack or something different, focused on hygiene and safety, Bisbell have the solution. If you’re looking for a space saving solution that leaves your work surface clear (it’s a rack, pod or the single storage solution for you) or if you prefer an iconic block with no slots to clean and a talking point stuffed with hidden technology to show off your knives (it's a magnabloc for you) or if you just like to keep them out of sight in a drawer but keep them sharp and your fingers safe (it's a magnetic blade guard for you). Bisbell are the worlds leading manufacturer and designer of magnetic knife solutions and we've been doing it here in the UK since 1971. Our first registered design the Bisigrip I has become an icon and is now widely copied, same with Bisigrip III and Bisichef - although they never get it quite right technically so it might look similar but they do not perform the same or come with the same guarantee’s! I guess we should be flattered that so many of our products and designs are copied and it comes with the territory when your the best at something and in reality it just makes us more innovative! 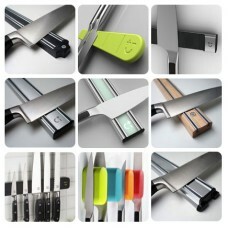 But if you want the best then make it a Bisbell magnetic knife storage solutions. And whether you’re looking for a knife rack, a knife block, a blade guard or something to look cool and add some design and functionality to your kitchen then you've come to the right place.